The line between our analog and digital lives is becoming more and more blurred every day. With the constant presence of electronic gadgets and a lot of our lives being lived out online, it’s sometimes hard to tell what’s real and what isn’t. This totally fantastic Samsung Portugal commercial blurs even the line between human skin and digital projection. In it, a model is covered with reflective silver paint and sits very, very still (for up to three hours at a time during filming!). 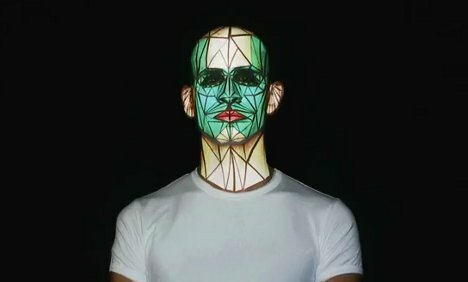 A digital “skin” is then projected onto the model in place of his own. He becomes a cyborg, a superhero, a soldier and a bunch of different works of art. The greatest thing about the ad is that it’s done in a relatively low-tech manner, with a real projector and a real model – but it looks totally seamless and absolutely fascinating. See more in Digital Design or under Technology. April, 2012.